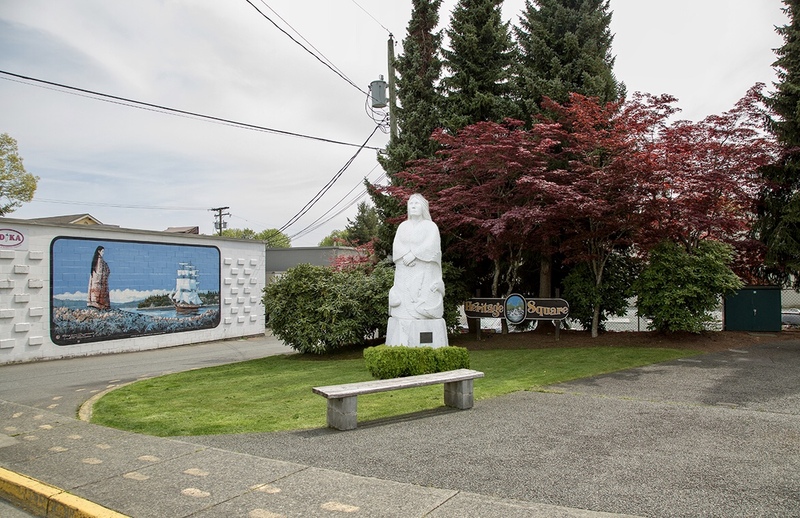 Art lovers rejoice, the Spirit Of The Earth sculpture, currently on the corner of Chemainus Road and Victoria Street across from the Chemainus Theatre Festival, will move to Heritage Square on Mill Street this summer. was approved by the Chemainus Advisory Committee and the Municipality of North Cowichan. The Municipality will pay up to $6,500 of the $11,500 relocation cost. The Murals Society will cover the remaining $5,000. Carved by artist Daniel Cline in 1999 with help from Ted Speirs and Marcus Carter, the 11-foot marble sculpture represents a mystic First Nations princess, her robe adorned with the wildlife of, and around Vancouver Island. An orca dives from her hair, an eagle soars interconnected with a salmon leaping upwards. The upper half of the sculpture depicts the quiet calm of the Earth, while the lower portion depicts the world in action. The princess represents the Earth, the life giver, the source of our livelihood. Earth Mother’s new home will allow visitors and local residents to appreciate the 360-degree carving at its best. The statue and base weigh approximately nine tons. The Heritage Square location ties in nicely with Arrival Of The ‘Reindeer’ In Horseshoe Bay,painted by Sandy Clark and Lea Goward in 1983 and Native Heritage, by Paul Ygartua also painted in 1983.